The Town School theatre is a renovated performance space in NYC for Nursery thru 8th grade students. 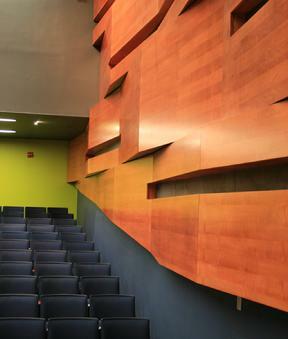 The theatre’s interior preserved an existing brick facade of a late 19th Century settlement house, while a new folded wood wall panel echoes the richness of the existing brick. All interior finishes have been refurbished with a new color palette. Both walls are washed with light from fixtures mounted above. General lights above also provide high light levels when the theatre is used as a classroom. Linear white lensed recessed fixtures flank the entry doors to provide a soft diffuse light to softly light the bright green walls.